Found myself looking for a new Readymade Art project, and came across this, TED talk, by Caleb Harper, http://www.ted.com/talks/caleb_harper_this_computer_will_grow_your_food_in_the_future. Just what was needed, but having checked through the OPEN AGriculture site, http://openag.media.mit.edu/ , Forum, Wiki and Blog it was obvious an insulated box was required. Which mass produced insulated box came to mind ? Yes, A Fridge. Just bought a new one and the old one went so no fridge!! to work on. Tried the local fridge seller but was told I would have to wait until one came in. As luck would have it, driving the country lane route back home, there appeared around a bend, in a passing place, the fridge you see here, so it was rescued to be resurrected as a Open AGriculture Personal Food Computer. It’s title, The ‘ WILDCARD ‘ Gro-Bot Organeec. is for when it is Exhibited as an Art Work in reality. !!! Safety alert !!! If you decide to use a fridge. 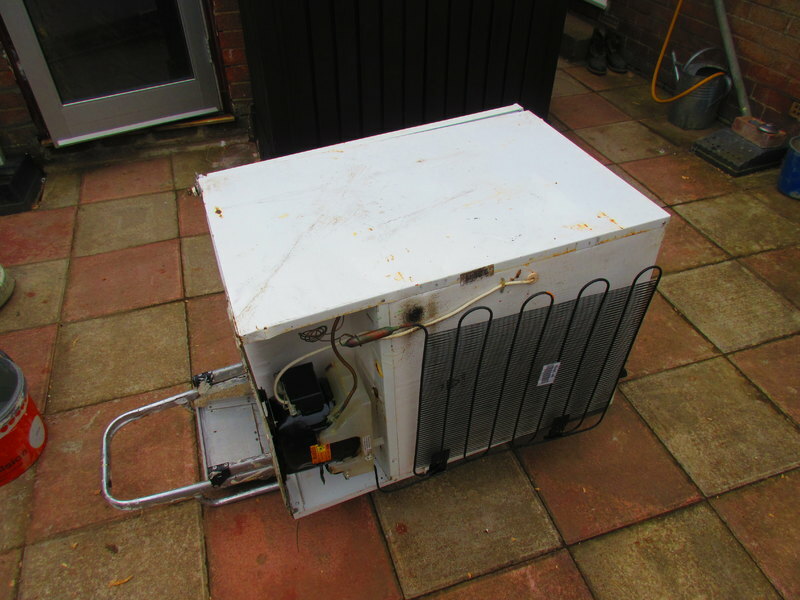 Older fridges using environmentally harmful refrigerant gases need to be de-commissioned by a registered fitter. In the UK it is illegal to vent harmful gases to atmosphere. Check your local laws for information regarding the scrapping of fridges. This fridge is labeled as using R600a refrigerant which is, isobutane, an inflammable gas. It is not harmful to the atmosphere but will ignite easily. NOTE : The dates of the posts are not the dates of publishing. In order to show the oldest post first each subsequent post has to have an earlier date.